With three theme parks and one waterpark, Dubai Parks and Resorts offers visitors a thrilling experience like no other in the region. The park is offering more than 100 indoor and outdoor rides for all ages. The attractions are split into different theme parks; Motiongate Dubai, Bollywood Parks Dubai, Legoland Dubai, and Legoland Water Park. Besides the thrilling rides, Dubai Parks & Resorts also offers a variety of dining options at Riverland, which is centrally located between the parks. Is one day not enough to try all the rides, then you can opt to stay at Lapita Hotel, a Ploynesian-themed family resort inside the park. This park is inspired by Hollywood and is the largest of its kind in the region. 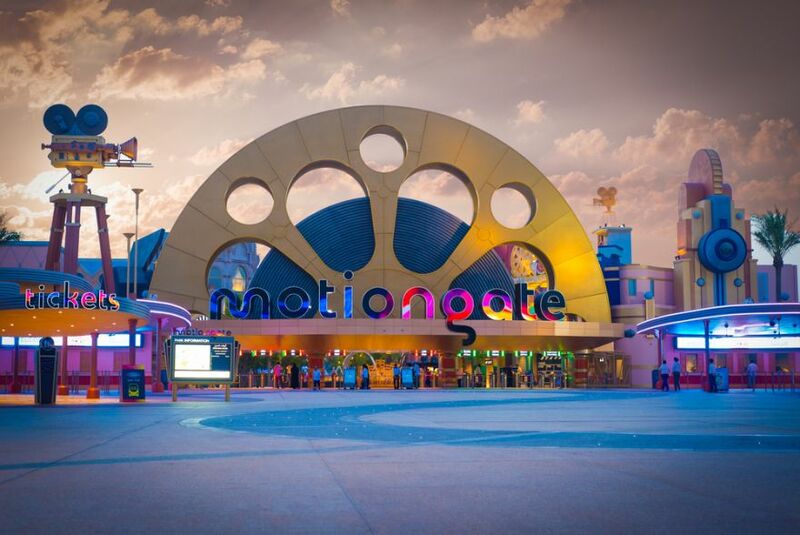 Motiongate Dubai brings three legendary film studios to life: Columbia Pictures, DreamWorks Animation and Lionsgate. Here you will be mesmerized as big-screen and animated classics from Smurfs to Shrek, How to Train a Dragon to The Hunger Games, are re imagined as roller coasters, immersive attractions, thrilling rides and much more. And that’s not all, you can channel your inner Ghostbuster, hop onto a flying ride to Madagascar and learn a few dance moves from the Step Up crew, all in one place. Plus, budding filmmakers are treated to the wonders of behind-the-scene film-making on real-life movie sets at Studio Central. The magic of Bollywood is transported to Dubai at Bollywood Parks – the first of its kind in the world. Packed with action, dance and romance, live the Bollywood fantasy with exhilarating attractions and passionate live performances based on some of the biggest blockbusters across five themed zones. You can fly across the world with Hrithik Roshan’s Krrish; hunt down Don (played by none other than superstar Shah Rukh Khan) through the streets of Dubai; and learn a few stunt moves from Salman Khan Dabangg-style. Make sure to catch the region’s first Broadway-style Bollywood musical, Jaan-E-Jigar, at the stunning Rajmahal theatre, and check out more interactive rides, multimedia theatre shows and action-fuelled experiences. Explore a world of Lego at Legoland Dubai, the ultimate theme park for families with children ages 2-12. Let your imagination run free with over 40 Lego-themed rides, shows and building experiences that the whole family can enjoy. With 15,000 Lego models made from 60 million Lego bricks, six themed lands and a mix of indoor and outdoor attractions, Legoland Dubai cannot be missed. Splash into a world of Lego adventures at Legoland Water Park, the region’s only waterpark designed specifically for families with young children. Let your creativity flow with over 20 Lego-themed water slides and attractions including the wave pool, Duplo toddler play area and Build-A-Raft River, where you can customise your very own Lego raft. Riverland Dubai is Dubai Parks and Resorts central entertainment, dining and relaxation destination, which you can access ticket-free. Take a glimpse through time as you stroll along the river through this destination’s four vibrant districts, The Peninsula, India Gate, The Boardwalk and The French Village. Enjoy shopping and mouthwatering cuisines from around the world at more than 50 outlets while you take in international architecture, bridges and other landmarks. Step into a new world at the Polynesian-themed Lapita Hotel, a family resort situated right in the heart of Dubai Parks and Resorts. Relax among swaying palm trees and alluring lagoon-shaped pools, as this hotel evokes the true nature of the Pacific Islands.